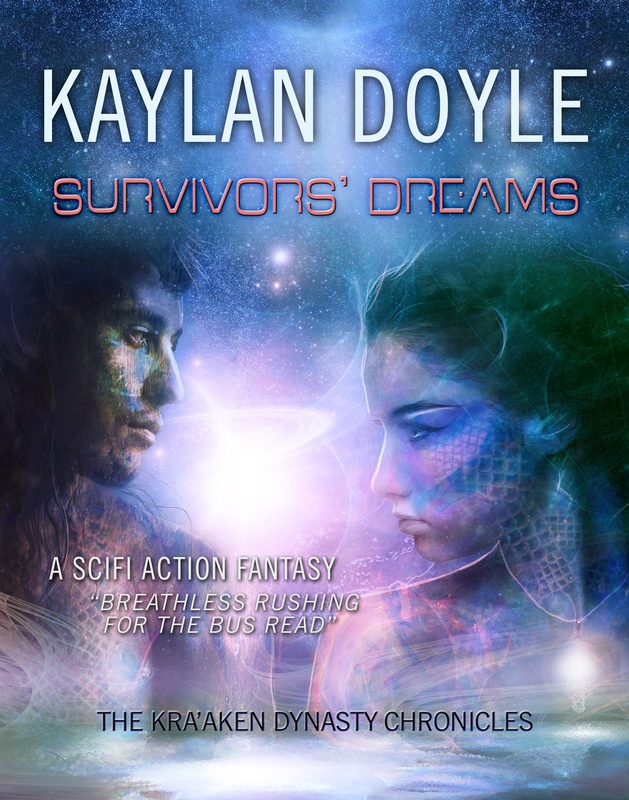 Following is part of an interview with Kaylan Doyle, author of Survivors’ Dreams. I caught up with her not too long after her return from a very successful book launch at DragonCon. Please feel free to ask her questions and leave comments. I’ve always thought writing science fiction would be extremely hard, but Ms. Doyle makes it sound like a fun challenge. Lisa: How do you come up with names when writing science fiction/fantasy? Kaylan: I generally think of a personality type which relates to a given name – often a nickname comes first. With Rak’khiel (Kel), I knew my female protagonist was warrior race, a “killer”, if you will. Kill became Kel, and with the Kra’aken language using a double letter separated by an apostrophe, Kel became Rak’khiel. I work phonetically so that there is a rhythmical, melodic feeling to the names. I admit Prince Helrazr was a tongue-in-cheek pun– because he is a handful, and a favorite with the ladies. Lisa: On a related note, how do you keep them unique without being too different, so that a reader struggles with pronunciation or feels pulled out of a story? Kaylan: By using nicknames whenever I can – they are short, and it doesn’t slow the pace for my readers. I’ve read enough science fiction/fantasy to be aggravated by unpronounceable names thirteen letters long – I try very hard not to do that. Lisa: I can build a world where I live that will be unique to some readers, but still have a frame of reference. If I write about a tree, readers will picture what that means to them. Yet when world-building everything is original. So how and where do you start, and yet still give readers a frame of reference? Kaylan: Oh, you’ve hit on the fun part! Take a tree – some of mine are red and silver – there are no limits. I reference the standard item – so my readers know what I’m describing and then I let imagination run crazy. I always try to include the senses – the sight of leaf color or bizarre shape of the tree, the touch and feel of the weird colored bark, the smells can be anything from nice to nasty – cinnamon to burning ozone. Lisa: Do you find building a character that lives in a different universe harder, or are the principles the same? Kaylan: It’s the same, truly, but with such complete freedom. Aliens don’t have to be nice, or kind, or helpful. Their culture, their rules, their rights and wrongs – they can be perfectly awful by our standards and great guys by theirs. So yes, I use our structure, but I often twist their societal requirements or customs. Lisa: The idea of not just creating a story, but creating a whole unique foundation for that story fascinating. When writing this type of fiction, where do you stumble, what comes easiest, what do you most look forward to, what do you most dread? Kaylan: Oh boy. I knew what the problems between Kel and Razr would be, and I knew the planet of Olica would be hostile to them. What I didn’t know was why, or who. To arrive at that, I wrote Kra’aken history and backstory until I found an old enemy species. To be honest, the only parts of the story I find difficult to write are the serious love scenes. What I truly love are the scenes where my strong female protagonist, with true justification, kicks backside with extreme prejudice. Lisa: Two of your main characters come from a world, through a portal, and end up in proximity to each other, even though they are in no way similar. You’ve written this in a very believable fashion, but did you at any point worry about the plot becoming a coincidence, and how did you avoid that pitfall? Kaylan: No, the possibility of coincidence never entered my mind. It probably should have – it would have been easy for the story line to feel contrived. J But when Kel and Razr told me their adventures, they also presented the logical “how” that they managed to wind up on the same world at the same time. Lucky for me! Oh and I do like to use nicknames and senses too, I am pretty sure I said that in my lost post.